Last week one of my co-workers brought me a beautiful bounty of fresh herbs from her garden - basil, boxwood basil (a relatively new variety that has small, tight leaves that have a concentrated basil flavor and which I am going to try to find so I can grow it myself), a beautiful variegated oregano and some lemon thyme. What a treat! I have been having fun deciding how to use them. The basil went into a few batches of succotash. The variegated oregano went into a frittata and an eggplant dish. And the lemon thyme? The apricots at the market were so beautiful last week that I knew on the spot that they were destined to be baked with chicken and the lemon thyme. I could hardly wait to get home and get started. 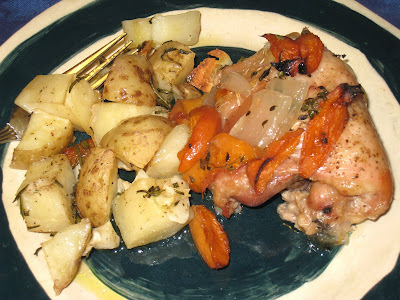 It was delicious paired with kennebec potatoes roasted with garlic and rosemary. The apricot has that beautiful tartness that counterbalances its sweetness, and the lemon thyme imparts a gentle tang of citrus and earthiness that brings everything together. Preheat the oven to 350 deg. F. Take 1 roughly chopped onion and layer it on the bottom of an 8-inch by 12-inch baking dish. Place 8 pieces of chicken (any cuts, but I like the dark-meat of the thigh, which is full of flavor and doesn't dry out as easily as breast meat), skin side up, over the onion. Season the chicken well with salt and freshly ground black pepper. Cut 1 pint of fresh apricots into 4 pieces each, removing the pit. Layer the apricots over the chicken. 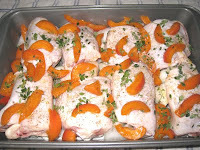 Take a generous amount of lemon (or regular) thyme (about 20 small sprigs) and sprinkle them over the chicken and apricots. If the herb is older and has a thick stem, then remove the leaves and sprinkle them over the top. Pour a little olive oil over the chicken, and then cover with foil. Bake the chicken for abount 45 minutes, then take off the foil. Bake for another 30 to 45 minutes, until the chicken has browned and the juice runs clear when pricked with a fork. 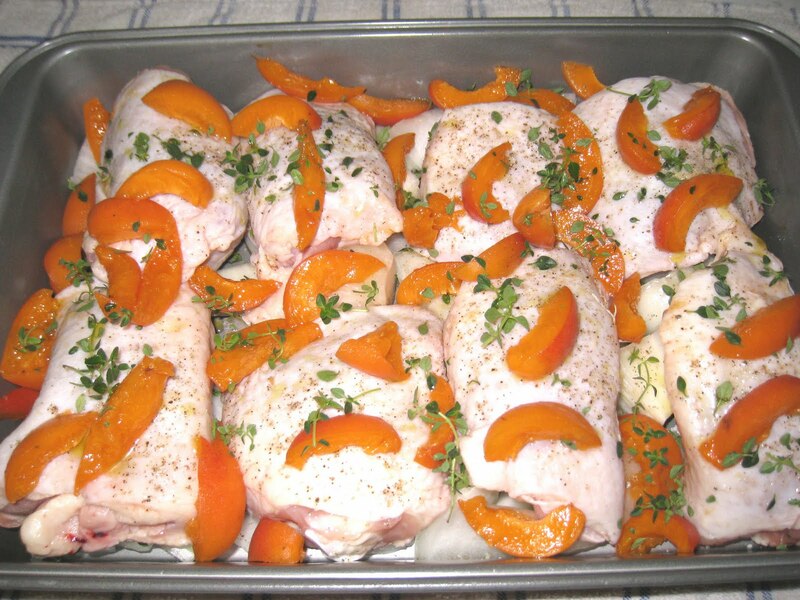 Remove the chicken and the apricots from the pan. Strain the remaining liquids and either use as a sauce or reserve for later use. (I actually found that the chicken did not need any sauce, so I put the strained liquid in the refrigerator, then removed the fat, and used it later in the week for a different dish. Double duty!